Hogenakkal is located on the Karnataka  Tamil Nadu border. 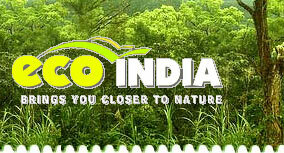 It lies at the distance of 114 km from Salem and 133 km from Bangalore. Hogenakkal waterfalls are the part of river Kaveri and is about 250 meters above the sea level. It is one of the beautiful places in the state. When the water hits the rocks a fine cool spray rises, that is the reason these rocks have been given the name 'Smoking Rock'. 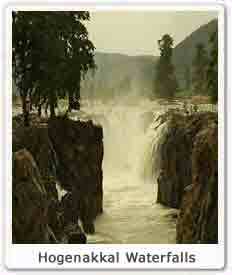 The best time to visit the Hogenakkal waterfall is between mid July to mid August when the water is at its peak. During this season water level rises from 20- 30 feet more. Hogenakkal falls are not the single waterfall but the series of waterfalls. Taking a bath in the waterfalls of Hogenakkal is considered as extremely beneficial for the health. It is so because of the widely grown herbal plants in the nearby areas. The place is widely known for the curative power of its water. This is the place where you can take bath along with the rejuvenating oil massage. You may find lots of people there to do massage for the visitors. The massager's or the maliswallas are expert in their work with the right knowledge of 14 massage points in the human body. Some of the major benefits of this oil massage includes - It increases circulation especially to the nerve endings, tone your muscles, increased mental alertness, smoothen the skin, improves elimination of impurities from the body and gives you better and deeper sleep at night. A visit to the Hogenakkal waterfalls is incomplete without taking a ride in the waterproof basket boats covered in buffalo hide or plastic stretched over light-weight wicker frames. These boats are locally known as Teppa. These are among the oldest water crafts in the world. The boats man steer the boats through the rapids of rising water giving you the thrilling experience. You can also engage on photography of the beautiful surrounding areas while taking the boat ride. Enjoy the full flow of the water and the fantastic view of the waterfalls from the boat. Hogenakkal is also the good place to try out your swimming skills. The water is quite challenging. Tourists can also go for trekking on the nearby surrounding hills. The treks are usually simple. Hogenakkal waterfall is the popular site among the film makers. There are many films songs shotted at this destination. For example a song 'Dil Hai Chootasa....' from the film Roza was shot here. The regular meals are available here, but you have to give the order in advance. The most favourite among the tourists is the fried and spicy fishes. Tourists are recommended to wear comfortable and loose clothes while visiting the place. Also carry along with yourself the mosquito repellent and dry snacks. The foremost attraction of the Hogenakkal falls is its vertical drop from the height of 20 meters with the thundering sounds. The area supports the rich floral system. The whole area covered with the tall trees and thorny vegetation looks a paradise. You can simply spend time at leisure enjoying the natural beauty or you can also indulge in the nature walk to the nearby areas. You can also hire the guide to give you the better insight of the area.